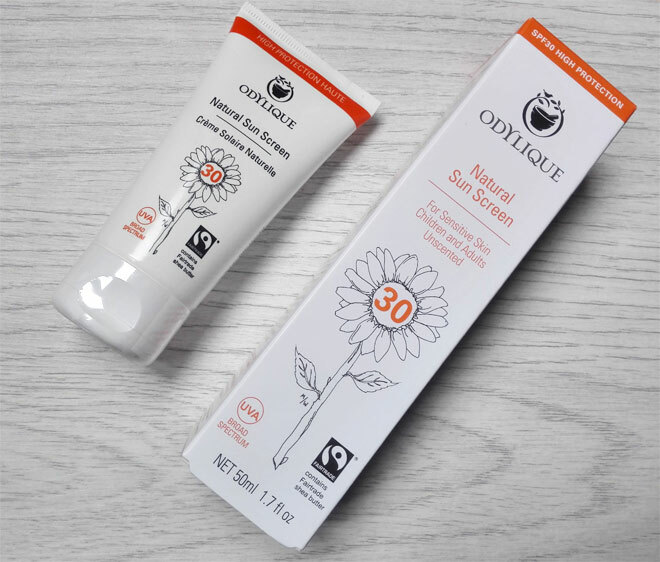 I wrote about Odylique Natural Sunscreen in my post about natural and organic sunscreens but I thought it deserved a full review on its own since I think it’s a really good natural sunscreen which I am happy to recommend. Last year I only tested a small sample of this sunscreen so this year I thought to get my hands on a full-size version of it to test it properly. 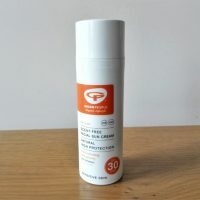 I was using this sunscreen last month in the heat of Slovenian summer (30+ degrees) and it protected me very well. I have not burnt a single time. The SPF 30 was enough for me although I like to use SPF 50 when possible. You have to remember though that sun protection is only there if you use the sunscreen correctly – you have to apply enough of it and re-apply every 2 hours. It’s also a good idea to avoid the worst heat of the day if you can. The Odylique sunscreen is certified organic by the Soil Association which not many natural sunscreens can boast with. It’s also approved by the Fairtrade Foundation and suitable for vegans. It contains the very finest organic botanicals such as nourishing shea butter and extracts of chamomile, rosemary and sea buckthorn which calm the skin and protect it in the sun from ageing with a powerpack of antioxidants. The sunscreen has a yellowish colour and feels quite rich on the skin. It’s easy to apply and doesn’t feel greasy after it absorbs into the skin. Last year I didn’t use it on my face as I was worried it may cause my skin to break out. But I decided to test it out on my face this year. And I did get some little white spots after using it so I came to a conclusion that it’s better not to use it on a breakout-prone skin. Instead, I would recommend Green People facial sun cream for that purpose which is also SPF 30. What I really love about Odylique natural sunscreen is that it doesn’t leave a white cast on my skin. It actually blends with my skin really well. Just see the picture above and below, after the sunscreen has been massaged into the skin (this is my arm by the way). 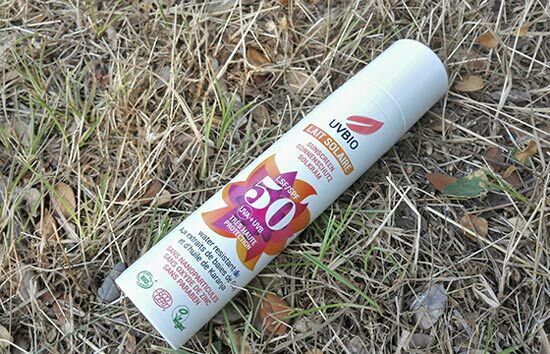 Just to mention that this sunscreen has no nanoparticles which some people like to avoid. It’s also unscented which makes is suitable for sensitive skin as well. It can also be used on children. In terms of negatives, I would just like to mention the tube. Reading some other reviews, I am not the only one who had some troubles getting the product out of the tube. When squeezing the tube, the product doesn’t come out easily at all in the beginning (it’s quite thick when cold) but then as you use more of the sunscreen it gets easier. But this shouldn’t be a problem if you are in a hot environment as the product will naturally loosen up in higher temperatures. All in all, Odylique Natural Sun Screen is lovely sun cream which I am happy to recommend. It’s one of the most natural sunscreens you can find and it doesn’t contain nano particles. It’s travel-friendly as well as it comes in 50ml or 100ml tube. Being vegan-friendly and suitable for sensitive skin makes it even more attractive option for green beauty fans. What’s your favourite natural sunscreen? Have you tried this sunscreen from Odylique? Disclaimer: This post contains affiliate links. If you purchase a product after clicking on a link I get a small commission which helps me run Be Healthy Now blog. This does not cost you anything. I find this a bit too thick for my face as well. It feels heavy. I like that it does not leave a white cast, even though I must say I find some white grainy bits in the crook of my arm at the end of the day, which is fine, though. Interesting, you get white grainy bits in the crook of your arm, I didn’t experience that but maybe I just didn’t apply enough to get that. Well, at least it’s not a big issue..